I would like to set the record straight. For all those who think attending the Cous Cous Fest in San Vito Lo Capo, Sicily is the plum of all plum foodie assignments, and the comments on my Facebook page have let me know that you are many, I would like to point out a few things. First, with all the couscous I ate while fulfilling my duties as one of the official judges (12 couscous dishes in three days), I had trouble fitting in all the other culinary delights this part of Sicily has to offer. Second, in a twist of cruel irony I ended up in Hotel Panoramic with a panoramic view of nothing. So with that out of the way we can get on with things. I’m back in Milan, back at my desk, but feeling a tad nostalgic about my couscous days in Sicily and more specifically about the wonderfully happy atmosphere in San Vito Lo Capo, to which I have pledged to return within the next 12 months come a national ban on couscous or a world pasta shortage. For the week of the festival San Vito Lo Capo becomes the staging ground for what amounts to a sagra dedicated to the crafts, traditions, and most importantly foods (to name a few: long twisty pasta called busiata, prickly pears, cannoli, dozens of types of pesto, tuna in every possible incarnation) from the northwest corner of Sicily. Italy has many sagre (the plural of sagra), but this has got to be one of the most engaging because it is at the same time hyper-local and international; there are not too many sagre where you see women walking around in full traditional African garb. About what I said concerning not being able to eat all the local foods because of my couscous commitments. I have a knack for finding my way out of trouble and consequently I did manage some non-couscous eating, and photographing. Finding a good cannolo in Sicily is like stumbling on a cactus in the desert. You’re a bit blasé about it because it confirms your preconceptions, but at the same time it makes you oh so happy because it confirms your preconceptions. 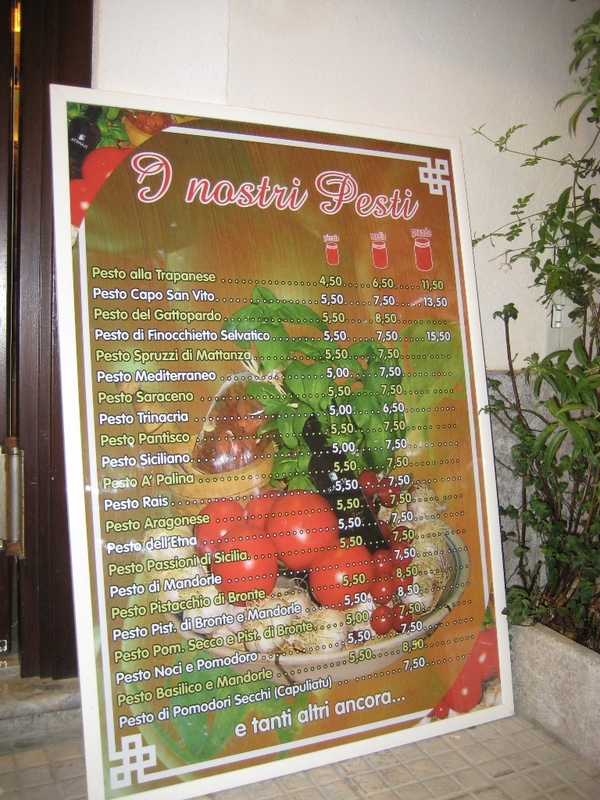 For all those who think Liguria has a lock on Pesto, have a look at this place selling more than 20 types of pesto. On a vaguely balmy September Sicilian evening, there is nothing quite like three fichi d’india, prickly pears, to refresh and recharge. Why doesn’t anybody eat these in the U.S.? 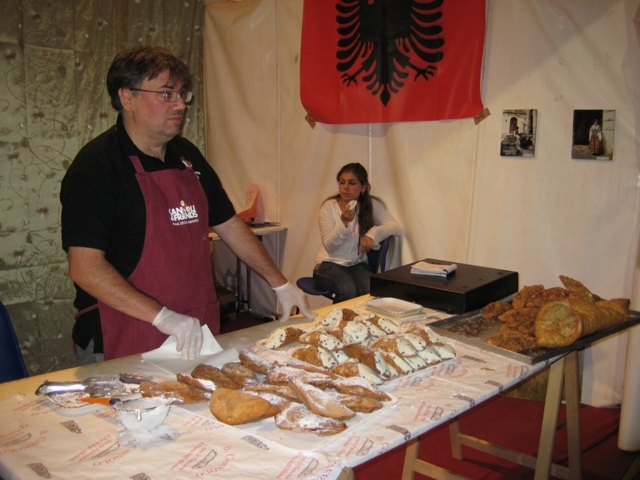 There is even a fichi d’india sagra in Sicily, of course there is a fichi d’india sagra in Sicily. The lucky host is Roccapalumba, halfway between Palermo and Agrigento in the heart of western Sicily, which will have the 12th annual sagra on 14-16 October. A dream sagra for sure though my attendance will have to wait 2012. In this part of Sicily the tuna and its every derivative are omnipresent, and that is not by accident. The tuna has been a staple here for millennia, dating back to when the Greeks roamed the island, and as such the fish is both revered and exploited. When I showed some surprise at a stand with a guy selling more than 25 tuna products he told me, “the tuna is like a pig, nothing gets wasted.” For the not-faint-of-heart, this video shows the way the tuna were traditionally caught off the coast near Trapani in what is called the mattanza. It’s not a real sagra unless off on the fringes of the festivities there are some stands selling the most random of things that have nothing to do with anything local. 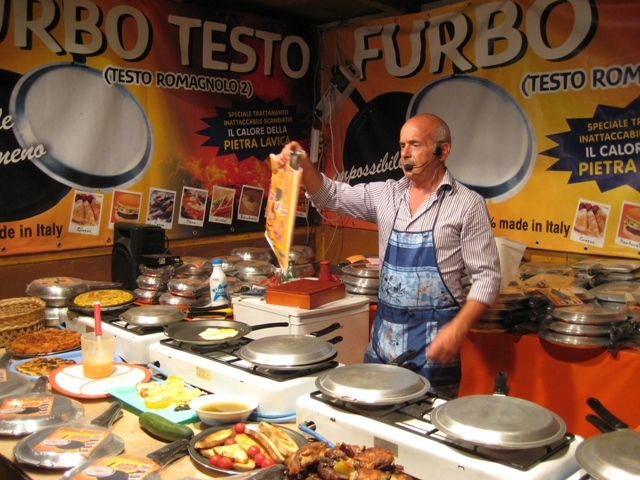 The Cous Cous Fest confirms its credentials with just some of these stands selling frying pans, kitchen knives, cheap toys, and many other things you might want to pick up on your next trip through Sicily. I AM ENVIOUS OF YOU ASSIGNMENT, YOU SEEM TO HAVE A VERY INTERESTING LIFE. IT’S TOO BAD I HAVE NOT SEEN YOU ON ANY OF YOUR TRIPS TO THE US. WE USED TO HAVE PRICKLY PEARS, I HAVE N OT SEEN THEM FOR AWHILE. WE LIVE IN PA. FARM COUNTRY, THE AMISH GROW A LOT OF THE VEGGIES HERE. I DID NOT LIKE THEIR CULTURE HOWEVER, BECAUSE THEY RAN PUPPIE MILS AND KEPT THE DOGS IN CHICKEN WIRED CONFINEMENT. PAUL SORVINO WAS INSTRUMENTAL IN GETTING THAT CHANGED. HE USED TO LIVE NEAR ME. NEVER MET HIM. AREN’T PRICKLY PEARS JUST THE GREATEST?! I’M NOT SURE WHAT IT IS ABOUT THEM, BUT THERE IS SOMETHING SPECIAL. THEY GROW ALL OVER THE PLACE IN THE WILD IN SOUTHERN CALIFORNIA, BUT NOBODY EVER GATHERS THEM, THOUGH I HAVE STARTED ON MY TRIPS BACK WHEN I’M LUCKY ENOUGH TO BE THERE AT THE RIGHT TIME OF YEAR. HOPE TO SEE YOU SOMETIME ON A TRIP THROUGH PA FARM COUNTRY. I am so very jealous. As an Italian, I grew up with cous cous done the Italian way, and I have to say I agree with you when you talk about the nuembr of poor imitations served in eateries. The pictures were stunning and I would have loved to have been there! How wonderful! Thanks for shrniag. I do hope you’ll share your tips and recommendations of places to go, eat and stay. My husband and I are starting to plan a trip to Italy in honor of my heritage. We got married earlier this year with a destination wedding to the beautiful countryside village in England where his surname originates. It was magical. Next we’re heading back to explore where my father’s family comes from in Italy. My grandfather is from the Pesto region. Yum! And my grandmother from around the southern portion. Can’t wait. Anthony, as you know, some assignments are better than others… and thanks for the kind words, keep checking back and let me know if you have any suggestions, comments, complaints. Once QuotesChimp realize that insurance is purely a business transaction, treat it as such. One way to do this is by making sure that everything is in writing. Thus, if an agent offers you a certain policy at a certain price, get it in writing. If you decide on a policy and the agent agrees to a binder (an agreement to provide coverage before the formal policy is issued), get it in writing. If the company wants some information from you, give it to them by letter and keep a copy for your records. Also, be sure to keep any correspondence or other communications you receive from the company. In this way, if there is ever a dispute (and there are an abundance of disputes between insurance companies and their customers every day) you will have the ammunition you need to be able to effectively present your side of the matter (see Post 40). I will. Check out the small producers in Sicily, doing good, organic stuff, often on ex-mafia lands. Coop sells some products, too. My only complaint is that I’m here in NYC, although the Occupy Wall Street protests keep it interesting. I completely agree on the small producers all over the south of Italy. I had hoped to check some wine and tomato producers in Sicily this time, but I didn’t manage. I have read about the production being done on confiscated land, that was actually discussed a little bit in San Vito. I just got back from southern Puglia yesterday and found some very interesting wine producers. E.g. : http://www.winemall.com/index.php?p=product&id=4063&parent=45. Was excellent. For wine producers, check out Guccione–they do biodynamic wines. Not ex-Mafia, just good, careful, more-than-organic winemaking. A small operation, near Camporeale, I think. Each Quotes Chimp should establish consumer information bureaus to help consumers comparison shop for auto insurance (and, eventually, other types of insurance as well). In addition to price information, the state should make available data on how long it takes to settle claims, the percentage of claims that go to court, the costs of providing insurance in the state, assessments of reserve ac�curacy, and similar information. Applicants would be able to either call an 800 phone number or access computers to obtain the information. Such a service would increase competition within the industry�and, as any good capitalist will tell you, increased competition should decrease prices and improve service. Will certainly have a look at Guccione and let you know. Split-limit liability packages are the kind the majority of QuotesChimp purchase. The risk accepted by the insurance company is expressed in terms of the maximum amount that will be paid under the policy per injured person and per accident for all injured persons. A typical example is $100,000 per person and $300,000 per accident. Wishing I was there to join you in the fun, I mean work! @Daniela, come on over and we can start eating together. BTW, I even know where to get a good cannolo in Milan, bit more difficult than stumbling on a cactus in the desert, but it can be done. Some years ago I’ve been in Sicily and a friend took me in an old albanian village close to Palermo and there I tried the best cannoli in my life . Maybe Piano degli Albanesi? Never been there, but heard it is very nice, and now with your Cannoli recommendation I’ve got an extra reason to go on my next trip to Sicily. It probably is Piano degli Albanesi. That’s where my cousin took me for cannoli, and I can say they’re incredible. He’d know–my uncle (his dad) is a fairly well-known chef in Sicily. Okay, that does it, next time Piano degli Albanesi for cannoli. All this talk has me craving them more than usual so I’ll be picking some up after from work from the Sicilian shop across the street from my apartment. Thanks for this one; it’s also one of my favorite ways to prerpae cod! Recently, I substituted a pinch of turmeric for parsley since it’s so good for us (I also add a bit of turmeric to my couscous, risotto, spaghetti sauce, soup and meatloaf recipes). Gives a subtle and nice flavor change!On another occasion, twelve minutes before my risotto was finished, I stirred in frozen peas and capers, then put my seasoned cod on top and poached it in the same pan for a one pot dinner (I used a deep saute pan). Delicious and easy cleanup! Let me know if you ever want to get in touch with my cousins Davide and/or Giorgio–they’re Facebook friends of mine–the next time you head to Palermo. Good company. absolutely will do. thanks anthony. I love the Moroccan style caidal tent set up on the beach. Couscous is speleld couscous in North Africa, where, of course the dish is a staple. According to my Sicilian sources, Sicilians make a dish called cuscusu, with a topping of fresh fish stew. I have included the recipe in my cookbook, Couscous: Fresh and Flavorful Contemporary Recipes. In it, I give recipes for Couscous Quenelles and Couscous tamales! I wish I could sample couscous with fried calamari.Rigolo et interessant mais ou est le contingent marocain? Kitty M, author,Cooking at the Kasbah: Recipes from my Moroccan Kitchen EAT COUSCOUS!